A colleague, Dr Paul Lowe, sent me a link this evening to this intriguing project called "Pocketlab"
Before he left NZ to take a job in Abu Dhabi, Paul was a leading science teacher here in NZ, and I remember well his experiments with using geo-location technology to monitor the downward movement of a parachutist, measring acceleration, velocity, and the size of the arcs through which the parachutist moved as he descended. All of this intrigued me – physics in the real world instead of the traditional trolley on rails in a lab – and measured through the imaginative use of computer-linked sensors etc. Paul was very imaginative in this way and through his work I came to appreciate the incredile potential of sensors in the real world to bring science alive. PocketLab is a wireless sensor for exploring the world and building science experiments. We built PocketLab for the curious explorers, educators, students, and makers to bring science, technology, engineering, and math (STEM) to life like never before. PocketLab connects with a single button to a smartphone or tablet and instantly streams measurement data that you can see and record. PocketLab measures acceleration, force, angular velocity, magnetic field, pressure, altitude, and temperature. Using our cloud software, you can easily analyze your data, create graphs, and integrate your data with other software. PocketLab has the same features as lab equipment that costs thousands of dollars but is low cost and intuitive to use. A couple of years ago I began using the promo video for Google Glass in some of my presentations to illustrate the way technology is beginning to become a 'part of us', rather than something that is entirely external (i.e. on our desk or in our pocket). My prediction was (and is) that this sort of convergence will continue, and with the recent announcement from Google about it's development of wearable technology, we see more evidence of this occurring. From a technical point of view this is all very interesting, and provides yet more gadgets for the technophiles to eagerly wait in line to purchase. For educators, however, it provides an interesting set of challenges and conundrums. Even now I visit schools that have a 'no mobile phone' policy, posting warnings to students of 'invisible, inaudible or in the office' etc. because we perceive student use of such devices as being a disturbance to the task in hand – learning. And disruptive they can be – the perpetual texting that can occur, mindless trolling through YouTube or watching sales on Trademe – we've seen it all. But what about when students are actually engaged in their learning, and have no time for such trivia – what use could be made of these devices to support their learning? In the past two or three years I've seen an increasing number of schools and teachers begin to promote this sort of responsible use with their students – with encouraging results. I've interviewed students who have articulated very capably how the ability to use these devices for 'just in time' learning has been a real assett to their learning for instance. 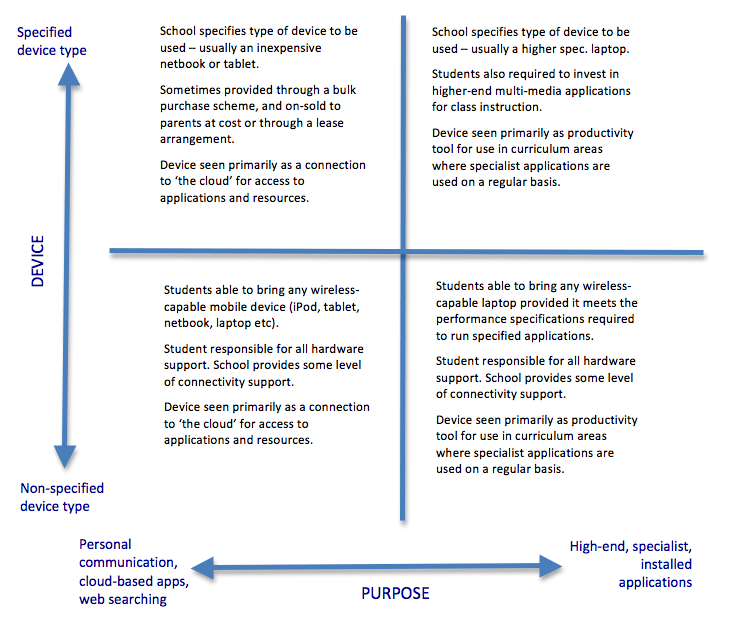 So as we move towards greater convergance, when it will be increasingly difficult to identify exactly when a student is 'connected' via their technology, what sorts of learning experiences will we need to design for them – and what sort of assessment practices will be required? Granted, at the moment it would still be possible to demand the removal of glasses and watches as students enter an examination room – but what about when the 'device' becomes a part of the jewellery they are adorned with or the clothing they wear? In thinking about the way forward on this we should not be focused on the technology and ways in which we can harness or control it in our learning environments. Instead, we should be focused on what we are doing to promote forms of modern learning practice, that foster creativity, collaboration and connectivity – and where learners will be encouraged to make use of these emerging forms of technology to enable, empower and embrace their learning. I remember back in 2007 when I got by first Android phone and installing an early verison of Layar. We used it for all sorts of things then, from creating orienteering trails to historical walks through the city. 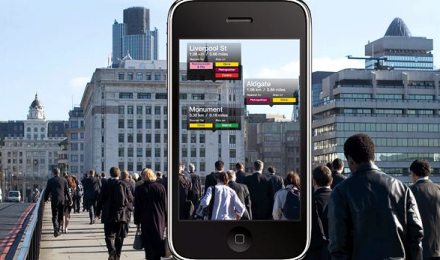 Things have moved on a lot since those days, and now there are all sorts of applications and devices that draw on augmented reality technologies to provide you with an 'augmented' view of the world around you. This list of Top 20 Augmented Reality Apps for Android and iPhone/iPad Users from DeepKnowHow provides an insight into what is now possible – from basic navigation to star maps! As time passes, I'm even more convinced that augmented reality will become one of the key technologies used in our classrooms to support student learning, providing rich contextual customized learning environment and contents for each individual. Something we need to bear in mind here is that the technologies conventionally used for augmented learning incorporate touchscreens, voice recognition, and interaction, through which the learning contents can be geared toward learner's needs by displaying plain texts, images, audio and video output. These are all characteristics of the devices many of our students carry around with them in their pockets – they're not reliant on the previously expensive equipment owned by schools! The other thing is that in addition to being users of AR, many of the apps appearing now provide student with the opportunity to simply and easily create their own AR experiences. Definitely something to keep on our radar! This second report written by a small group of academics in the Institute of Educational Technology and the Faculty of Mathematics, Computing and Technology at The Open University proposes ten innovations that are already in currency but have not yet had a profound influence on education. 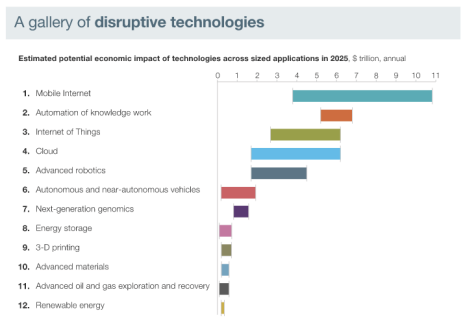 The list includes many of the same technologies identified in similar lists and trends elsewhere (inlcuding CORE's ten trends), which of itself is indicative of the fact that we ought to be at least mindful of what these things are and the potential impact they may have on what we do as educators. Like their 2012 list, the emphasis is on the tertiary space, but with lots to inform what is happening and likely to happen in the school sector. the prediction was wrong and didn't eventuate? that the prediction has perhaps 'morphed' into one of the emerging themes identified?" Compare the two lists here…. It's easy enough to come up with lists, but understanding how these sorts of predictions eventuate is the real issue here, and where the real focus of attention needs to be (IMHO). Technological innovation (e.g. in NZ) has a history of failed attempts, false starts, and unforeseen consequences, alongside the 'disruptive' technologies that get to feature in the headlines. where/how are you using or seeing these things used effectively? in what ways are they actually shaping your pedagogical practice? what are the actual drivers involved? The institution? The technology? The learners? what are the barriers and emerging frustrations you see? what are the opportunities and unexpected outcomes you observe? Lots of food for thought… let's get the conversations going! I had the privilege of attending the NZ Christian Schools Educ8NOW conference held at Elim Christian College today, where I presented a couple of workshops and hosted two 'connect' sessions for general discussion. My workshops focused on strategic issues – the first around how we can strategically plan our school's professional learning and development programme so that it caters for both personal needs and helps us achieve school wide goals. The second workshop was on using a pedagogical decision making model to support our thinking about technology investment, to ensure anything we do actually supports the teaching and learning in our schools and classrooms, as opposed to being introduced independent of that sort of thinking. The topic of BYOD continues to be a hot topic in schools, with many schools I visit looking at investing in wireless technologies to support students (and staff) bringing their own device to school. While there appears to be agreement that the notion of BYOD is something to be pursued, there isn't a shared understanding of what that might mean in a school context. In trying to resolve this in my own mind, and to make it possible to allow others to see how different philosophical positions may influence the implementation, I've drawn up the simple matrix above (click on it for a larger version). On the 'y' axis is a continuum based on whether the device is specified or not specified. The 'x' axis is about purpose, ranging from using the device simply as a personal note-taking/research tool linking to cloud applications, to specialised devices capable of handling higher-end, specialised and installed applications. In each of the four quadrants are descriptions that illustrates the possible scenarios that emerge based on where on each continuum staff and school leadership decide their priorities lie. For me, it is important that sufficient time and thought is devoted to getting agreement among staff, students and parents about the purpose and intent of any BYOD programme. I'd hope that this matrix may be handy to use in this process. Prioritising the provision of a robust, enterprise level wireless network across the school. Include in the school network plan appropriate traffic management approaches to cater for the numbers of devices anticipated, policy decisions around filtering, and provision of storage and backup of student data. In-depth community engagement to ensure informed decisions are made about the extent of ownership, readiness to participate etc. and to ensure general buy-in. A thorough consultation with staff to ensure the devices will be used in conjunction with learning activity, and that this is supported by goals in the school’s Strategic plan, the school’s Curriculum plan and the ICT action plan. Professional development opportunities provided for staff. Development of a communications plan that outlines the purpose, intent and strategy for all stakeholders. Supporting policy and procedures, including updating of the acceptable use policy to reflect individual ownership of devices. Consideration of what software will be required for use, or whether the devices will be used primarily for web-based applications (i.e. Google docs) rather than installed applications. I'd be interested in feedback from others on how they've addressed this challenge?